Back in May of 2009 I posted an article titled, “bing – Microsoft’s New Search Engine”. My intent of the article was to let people know that Microsoft had created their own version of a search engine that would be a main competitor to Google and Yahoo. I was actually impressed with Bing (back then) and I still am today; HOWEVER, following that article I received over 100 comments asking me (as if I was the creator of Bing) to remove Bing from their computers. Apparently Microsoft, as part of their marketing strategy of Bing (in a viral type of way), was making Bing show up on people’s computers in various ways and then making it difficult for people to then remove Bing from their computers. To me, not a very good way for people to develop a warm and fuzzy feeling for something. I think Microsoft learned from that strategy and has been trying to get people to use Bing by sensationalizing it through various media sources (such as through TV commercials). Today I happened across another attempt by Microsoft to bring Bing home and to draw attention to the power (and beauty) of the Bing Search engine. Go to, BING IT ON, where you can do a side-by-side search analysis of the Bing Search Engine and the Google Search Engine. The site is sort of competitive in nature and gives you the opportunity to perform searches, then rate the outcome, as to which performed better. If anything, this is a nice source to perform a more extensive search using two very powerful search engines. With 80 Plus Gold certification, a fully modular cable set, and low noise levels, the AX750 has no rivals at its wattage. Appears in today’s world of computing we are definitely moving away from the desktop form of computing to the more mobile form of computing, such as tablets and smartphones. In the end, no matter which direction we go, we still need to use the computer, whether it be in the form of desktop or tablet, to get our work done. Working on a Microsoft Word, Excel or Powerpoint file on a tablet vs. a desktop can be a real challenge. As we continue to move toward the tablet form of computing I am seeing more and more applications that are trying to emulate the desktop experience of using Word, Excel or Powerpoint on the tablet. As a matter of fact, I have many of these types of apps installed on my tablet and really in the end I am not using them to edit or create documents; instead, I use them more or less as a document viewers. This past week I happened across another Android and iPad app, called CloudOn that really looks promising and is very close to emulating the desktop when it comes to creating, reviewing and editing your Microsoft Word, Excel and Powerpoint files. Not only that, CloudOn can connect directly to your Box, Dropbox, Google Drive and SkyDrive Accounts; AND, the real topper is that CloudOn’s file viewer can view virtually any type of file (including PDF, JPG, PNG, GIF, etc.). So far, what I am experiencing, is a pretty darn good app that seems to have the right fine tuning in place for working with my Microsoft Office files; PLUS, CloudOn with its’ powerful viewing capabilities will replace many of the separate apps I have installed for those purposes. • Use Microsoft Word®, Excel® and PowerPoint® on your Android Tablet and Phone to create, review and edit documents. • Rename, delete and manage documents with your Dropbox, Box, Google Drive and SkyDrive accounts. • View virtually any type of file, including: PDF, JPG, PNG, GIF, etc. • Share files as links or attachments via email directly from the workspace. • Display, edit or create charts, change formatting, spell check, insert comments, etc into any Word, Excel or PowerPoint files. • Use the FileSpace to see a log of all the activity on file including edits, notifications and notes. • Track changes while reviewing Word documents. • Use pivot tables and insert formulas in Excel workbooks. • Display and edit transitions in PowerPoint slides and present in full presentation mode. • Open files directly from your device email accounts as well as Dropbox, Box, Google Drive and SkyDrive. • Automatically save documents to avoid losing changes. Yahoo, in an effort to to get us out of the archaic method for which we perform searches and to improve its’ position in the world of search engines, recently developed and released a very cool iOS app and browser plugin called Yahoo! Axis. Yahoo! Axis, at this point, is available as a browser plugin (for Google Chrome, Mozilla Firefox, Microsoft Internet Explorer, and Apple Safari) and as an iPad/iPhone app (with an app for Android on the radar). As with any search engine, you start out with a search box. In my case, after installing the plugin for Google Chrome, the search box is located at the bottom left corner of the browser window. What is cool about Yahoo! Axis is that, as you type in what you are looking for, a filmstrip-like view across the bottom of the browser window instantly appears revealing your search results as thumbnails. Using the wheel on your mouse, you can easily scroll through the thumbnail results and click on the page you desire to visit. The thumbnails are very easy to see. For example, I typed into the Yahoo! Axis search engine box, weather and my zip code. I was instantly provided visual thumbnails of the weather and many other weather related options. In addition, you can save pages as favorites to read later. If you have a Yahoo account, you can sync your search results and favorites across all of your devices. For example, if you started a search on your iPad, the next time you open Yahoo! Axis on your computer desktop, you’ll see a “Continue from iPad” choice; plus, the favorites you have archived are also available. The one element of the internet that has not really changed much over the past decade is the method which we interact with search engines. You input what you want to search for and the results is provided as a list of links where you are required to navigate back and forth from the generated list. By the time you open numerous browser tabs and navigate back and forth to the search results, it is easy to find yourself getting lost. I came across a new method of searching, called SearchLion, that uses current browser technology and serves as the frontend interface to the Google and Yahoo search engines. SearchLion is different than anything I have experienced when it comes to performing a search. You enter what you are searching, as you normally would; however, when the list of results are provided you will notice that the listing is to the left side of your screen. Adjacent to each link in the listing you will see a small “open” button which will allow you to open the link on the right side of the screen in a fully navigable and resizable browser window. You can do this with each and every link of interest without ever leaving the search result screen. During my testing of SearchLion I found it to be very fast; and just the ability to open a link in an adjacent window is definitely a productivity boost right there. That feature is only one aspect of SearchLion. It get’s better! To really appreciate SearchLion you have really have to stroke its’ mane and take it for a ride. SearchLion is currently in beta and developers seem to be really open to any suggestion you (the enduser) may have to offer. Instead of me boring you with my explanation of these awesome features, you can get a detailed explanation of these features, along with videos, [HERE] . Also, to follow along with the development of SearchLion, I encourage you to bookmark their blog [HERE]. In the end, I know I will keep going back to SearchLion to take advantage of the ingenious method of searching and to see what is new in terms of its’ development. I Did Not Have A Hand In This bing Thing! When you write a blog post or article you hope to get feedback, through the comments section, from your readers. I always make it a practice to respond back, even if it is just to say thank you; however, with anything there are exceptions. There was one article, back in May of 2009, titled bing – Microsoft’s New Search Engine that went viral with the comments to the point that I stopped responding and I’ll tell you why. Following that post, I must have hit pretty high in the Google search page ranking (or bing page ranking) for the article. As a result people must have thought that I had a hand in this bing thing or that I actually developed bing. Following that article I immediately, and still do to this day, received really nasty comments telling me how bing took over their computers and they want me, yes me, to remove it. Now, there has been a few people who have come to my defense and have pointed out that poor Rick has no play in this. I will usually give them a pat on the back with a response of some type. I really think Microsoft, who owns and operates bing, should at least compensate me with a prize or something for promoting bing and for ultimately absorbing some of their pains as a result of the promotion. a poor blogger I would not sing”. This may not be turned “ON” yet in your region, but Google has introduced a new feature, called instant, where real time instant search results are provided. Go to Google.com and start typing in the box something you desire to search for. As you type, what you are searching for, a drop down box will appear (as usual), but the search results will instantly start appearing. This new feature eliminates having to hit the “Enter” key on the keyboard after you type in your entry. Now, if you are not in favor of this new feature, you can turn it off by clicking on “instant is on” and selecting “off”. You can read more about Google Instant [ HERE ] . Welcome everyone to this round of Geek Squeaks’. If you do not know what Geek Squeaks’ are, then you do not know what you are missing. Each week, What’s On My PC selects recent articles from the blogs (and web sites) that are currently on the What’s On My PC blogroll. This is my way of saying “Thank You” to a great bunch of bloggers that I am associated with. Freeview HD PVR. The race is on! They’re all part of a stellar line up of new casual games that can be found on Bing – available right in the Bing entertainment browser! Earlier this summer Yusuf mentioned casual games were part of our new entertainment experience on Bing and these new games are just one more way we are continuing to expand and deepen your online gaming experience. The “good” here with this is that the goal is to provide a malware free experience in a category (such as online gaming) that has a reputation of dropping malware on people’s PC’s. I am sure all of you have used the Google search engine. As a matter of fact, when I setup a PC, It is not uncommon for me to set the browser homepage to Google. This makes for an excellent and an easy launching point for the user. The only problem with doing this is that the Google search engine page is not the most attractive page out there. Select (click on) a background image (or theme). You can even use your own images. Once the theme loads in your browser, click on “set as homepage”. You can change the theme as many times as you want by visiting Favoorit and following the steps outlined above. At the top left corner of the Favoorit page you can also add some of your favorites (most used) sites. Each week, What’s On My PC, features recent (within the past 7 days) links to articles that are authored by the blog owners who are associated with the What’s On My PC blogroll community (at the sidebar of the blog). If you are someone who has that special obsession for computers and information technology, I highly encourage you to bookmark these blogs and make Geek Squeaks’ part of your weekly routine. Are we going to shed most of software? Apple iPhone HD on AT&T and Verizon this summer? Have you heard of Duck Duck Go (search engine)? Can a “Secret” CPU Setting Really Improve Boot-up Time? I have found that locating specific files and folders on the computer can be a daunting task; especially if you rely on the Windows based search function which is driven by an index. Windows typically uses the index as a repository (or database listing) of your files and folders. Indexing is a beautiful (and fast) process providing that the file (or folder) you are looking for is listed in the index. If your file and folder is not in the index then the search process is noticeably slower and in my opinion can be a frustrating experience. Personally, I use the Windows search process only when I have to; otherwise I resort to a third party software option such as UltraSearch. The “cool factor” with UltraSearch is that it does not rely on indexing; instead it relies on the Master File Table (MFT) to spit out its’ results. In my testing this app was very easy to use and was incredibly fast for being a non-indexing search application. Another plus is that there is a portable version available, as well as a full install version, that you can use straight from your flash drive. The only condition to using this app on your PC is that your drives must be formatted using the NTFS file system (which is a Windows standard these days). There are other file (and folder) search apps out there, but this one ranks up there with being blazingly fast. The current version of UltraSearch is in beta and can be downloaded from [ HERE ] . UltraSearch searches files on local NTFS drives and provides the results within just a few seconds. UltraSearch does not use a previously built index or background process, it achieves its speed by working directly on the Master File Table (MFT) of the NTFS partitions. You can enter a file name or a pattern like *.exe and often will see the results already while typing. Additional information like size and last change date will be shown for the listed files. Moreover, the Explorer context menu is available inside UltraSearch. Google Fast Flip displays captured images of news article pages from partner sites in such a way (similar to thumbnails) that you can literally flip through the various pages. You click on the story you want to read and you are taken directly to the source. I correlate Google Fast Flip with the speed dial that some of us use in our browsers such as Opera and Firefox. The stories are grouped by categories, such as Entertainment, Business, Opinion, Politics and Most Viewed. Readers can flip through stories quickly by simply pressing the left- and right-arrow keys until they find one that catches their interest. Clicking on the story takes them directly to the publisher’s website. You can click [ Here ] to see the sources currently used for Google Fast Flip. I want to share with you today an unique search engine, called “Panabee”, that is a specifically designed search portal for bloggers, journalists, shoppers, marketers, and other users who often search and compare multiple web sites. Panabee is currently in beta, is FREE to use, and requires no installation. A unique aspect of Panabee is that users can search favorite sites without repeating queries or opening new windows. When querying Panabee to get a search result, Panabee provides the results in a “side-by-side” view that can be compared within the same window. To give you an example. I performed a search with Panabee for a Stylus 1010 camera. By default, Panabee went to work and provided the search results from Google and from Bing – “side-by-side” – within the same window (and browser tab). If you have a large monitor; using Panabee will enhance your search experience dramatically. example of how Panabee works. The “cool factor” to Panabee is that you are not limited to just a few search engines AND at any time you can toggle between the side-by-side view to full window view at the click of a button. To change to a different type of search engine and to view a category listing of available search engines, simply click on the “Sites” button at the top of the Panabee search panel (see below). To toggle from side-by-side view to full window size, click on the “Display” button at the top of the Panabee search panel. (see below). With Panabee, users can search favorite sites without repeating queries or opening new windows. The side-by-side view offers faster searches because results from the underlying sites (e.g., eBay, Amazon, Google, Bing, Twitter) can be compared within the same window. Assume you’re shopping for a digital camera, and you want to compare Amazon and eBay. With Panabee, you can see their search results side-by-side. If the original results aren’t helpful, you can search Google and other sites with a single click. The same idea applies to other areas where you tend to search multiple sites (e.g., coupons, recipes, videos, images). Panabee offers more reliable searches because you’re viewing the underlying sites in real-time whereas traditional comparison sites often suffer from outdated results or slow indexing. Panabee excels at general searches since you can see results from Bing, Yahoo!, Google, Ask, Wolfram, and other search engines side-by-side. Fefoo is a search application that changes the way we use search engines. Fefoo is an application that is engineered to work with multiple search engines to make your searches more effective and better. FeFoo is designed to search by categories; thus, making your search more refined from the time you start searching. As a result you spend less time searching. Loading fefoo is very, very fast. The first time you use fefoo it is cached (saved) automatically to your disk thus making subsequent load times in the milliseconds. Another neat thing about fefoo is that you can add and remove categories. The first time you visit fefoo, it gets cached on your browser. After that everytime you search its done on your computer. That is one reason why it feels so fast. There are no roundtrips back to the server every time you search. The search is as fast as the search engine that you are using. fefoo works transparently without adding any overhead while searching. How to add fefoo as a search provider? After you perform a search with fefoo, a search bar will appear at the top of the browser to assist with further searching. This search bar is not permanent and only appears when you perform a search. The more I use fefoo the more I am liking it. Definitely a keeper on my PC. The “What’s On My PC…” blogroll community continues to produce tech articles that are comparable, in content, to commercial blog publications. It is an honor to be associated with such a great bunch of authors that produce and deliver information with the objective in mind of helping other people. Reflected is a sampling of posts, created by these authors, from the past week. Spam and Botnets – Who’s Responsible? How secure is your password nowadays? Keep your eye out for “bing”. Bing is Microsoft’s NEW search engine that will replace Microsoft’s Live Search. Reportedly this strategy will help bring Microsoft in line with their main competitors (Yahoo and Google). Reports from Microsoft indicate that bing will be able to dig deeper and provide more relevant search results; PLUS, your search results will be presented dynamically in search categories, which is a different approach than what we are accustomed to. 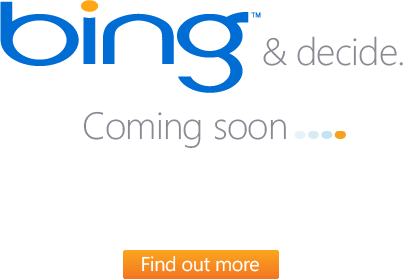 According to Microsoft, bing will be going live on June 3rd and will be phased in over the course of several days. The official bing website is, bing.com. To find out more about bing, and to watch a video demo of bing in action, click the “Find Out More” button below.